What is Low Level Laser Therapy ? Low Level Laser Therapy (LLLT), also known as Photobiomodulation, is an advanced medical technique that uses light in the form of ‘photons’. This light or ‘photons’ stimulate the body at a cellular level which then promote cellular function and regeneration. As LLLT uses cold (non-thermal) laser to speed up cell regeneration, it is a very safe and extremely effective treatment option for a number of skin and body conditions. The benefits include reducing pain and inflammation, and accelerating tissue repair and regeneration. Lasers are essentially a form of highly-focused light, and medical-grade cold lasers in particular are used to promote cell stimulation and renewal without heat or discomfort to the affected areas, either on or within the skin. Similar to how the skin absorbs sunlight to produce Vitamin D, when laser light is applied to the skin through a process called Photobiomodulation, the cellular energy ATP (Adenosine triphosphate) levels increase in the Mitochondria (powerhouse of the cells). This increased cellular charge promotes cellular function including tissue repair, inflammation and pain relief, assisting the body in bringing cells back to order from chaos. Increased ATP levels in the Mitochondria (the powerhouse of the cells) promote stimulation and regeneration of damaged tissue, encouraging cellular renewal as well as collagen and elastin growth. This results in a decrease in inflammation, redness, pain and discomfort. Medical grade, red and infra-red wavelengths make the laser powerful enough to penetrate into nerves, muscles and other tissues allowing it to work on a much deeper level compared to other treatment therapies. The damaged area becomes noticeably stronger with increased lymphatic drainage and faster recovery. The gentle and non-invasive nature of the therapy means it can be used anywhere on the face or body. Reduce Inflammation– By increasing the amount of microcirculation of blood and lymphatic drainage, as well as anti-inflammatory compounds into the inflamed area. Reduce Pain– By stimulating increased levels of natural analgesics or pain-killers (beta-endorphins), long-lasting relief from pain and discomfort can be achieved without the use of drugs. 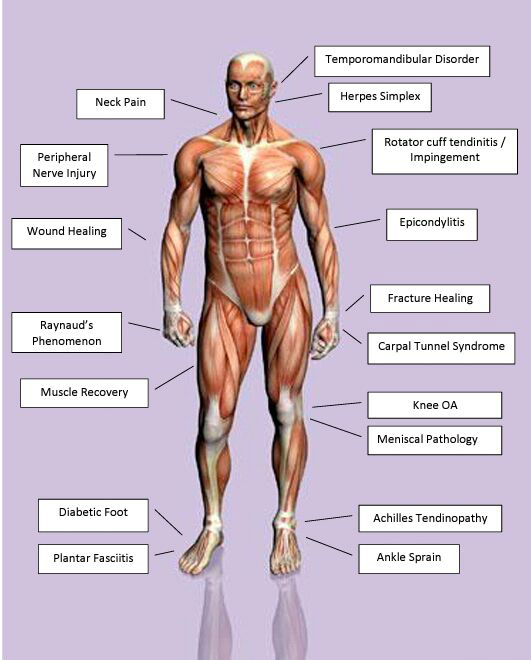 This can be achieved for both acute and chronic physiological conditions as well as on trigger points in musculoskeletal areas. Accelerate Tissue Repair– By affecting the mitochondria, LLLT accelerates ATP production (cellular energy). This increases and accelerates the overall activity of the cells responsible for repairing tissue (bone, muscle, ligament, skin, and nerves). Increased rate of repair, results in regenerated or healed tissue with improved quality and strength. Scar tissue (both new and old) shows improvement with minimised adhesions and scarring. LLLT increases the production of endogenous opioids, serotonin, acetylcholine and nitric oxide in the skin, which brings oxygen, fuel molecules and other metabolites to injured tissues. These stimulate the natural healing processes and aids in resolving inflammation as well as have a selective inhibitory effect on pain. LLLT stimulates the body’s repair processes, while optimizing the speed of repair in acute injuries where non-healing or chronic conditions are present. Yes, as it is gentle, painless and safe for all skin types, conditions and colours it is an ideal treatment for everyone, with no downtime involved. The few exceptions include cancer patients and pregnant women. Recent or acute injuries normally respond the quickest to treatment, where you may notice a significant difference within the first few visits. Long-term or chronic conditions normally take longer to respond, especially if they have been present for years. This means noticeable improvement may take anywhere from days to weeks. No, as it is a gentle, non-abrasive, and 100% pain-free treatment, this totally eliminates the pain and discomfort element. Being non-thermal it does not heat or hurt the skin, and does not damage the tissue or cause other complications. There are also no special care requirements to worry about pre and post-treatment.